The Reggio Emilia education model reflects a number of effective pedagogies in which enhance children's learning experience within the given learning environment. 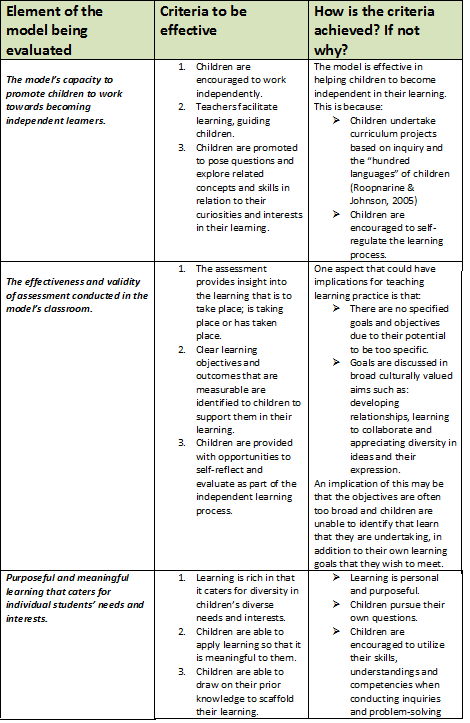 The below table (Figure 1.3) evaluates a number of elements within the Reggio Emilia model, against a specific criteria followed by providing evidence to show how the criteria is reflected within the model. ABOVE: Figure 1.3 showing elements of the Reggio Emilia model evaluated against a specific criteria. Whilst Figure 1.3 shows a number of positive impacts on children's learning; it is also evident that the Reggio Emilia Educational Model has some implications, particularly for teachers. There are no specified learning goals in this approach. Whilst it could be argued that this is positive because children are not limited to specific learning goals; it is important to recognize goals and objects as paramount to effective learning. It may be difficult for children to be independent in their learning without having set or negotiated learning goals. They may have difficulty establishing a direction to take without the guidance of learning goals. Essentially such learning goals would support children in providing them with objectives to work towards in their learning. Overall, the Reggio Emilia learning model is effective in promoting children to engage in learning that is meaningful and develop curiosities to drive their learning. However, it cannot be dismissed that learning goals are imperative to guide children in their learning. Without them, children may find it difficult to take a direction in their learning that interests them and is meaningful.